Tie-dye effects aren’t just for clothing anymore. Whether you need a project to entertain the kids or just love brightly colored stationery, tie-dye painting fits the bill. The end result in this project can go on to decorate windows as “stained glass,” get cut up into colorful snowflakes, or even act as original parchment for a heartfelt letter. Plus, all the necessary supplies are common household items. Lay a cookie sheet on a flat work surface. Squirt some foam shaving cream into the sheet, making sure to cover the inside of the sheet completely. Smooth the shaving cream out with your fingers. The surface need not be perfectly smooth, but the shaving cream should be an even ½-inch to 1-inch layer over the entire sheet. Drip one or two colors of food coloring over the shaving cream. You don’t need much. Three to five dime-sized puddles of dye should be enough. You may use one color or mix colors like blue and red, yellow and blue, or red and yellow. More than two colors may make the paint look muddy. Stir the puddles into the shaving cream with your finger. The point is to achieve colorful swirling patterns. Don’t stir too much or the cream will end up as one uniform color. You want as many gradients of light and dark as possible. Lay a piece of paper over the shaving cream and gently press down. Lift the paper off the cream. Crumple up a paper towel and tap it over the paper. This should spread the paint out in a tie dye-like effect. Allow the paint to dry overnight. 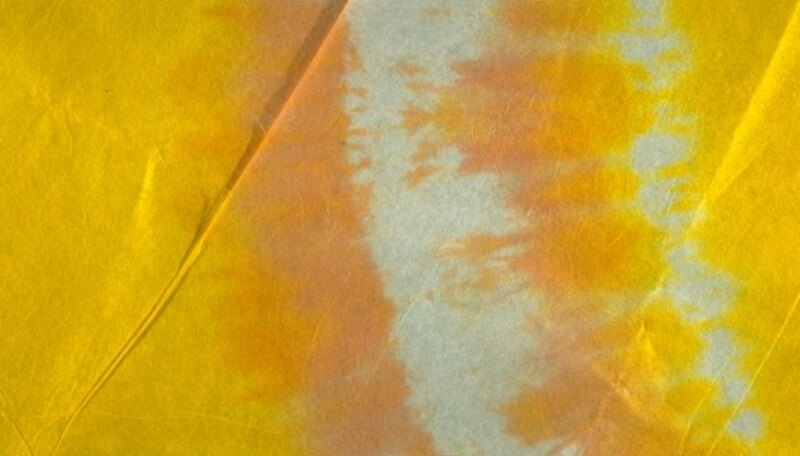 Try a tie-dye technique on regular paper or walls with marbles. Place a piece of paper in a cardboard box and squirt a little paint on the paper. Toss in some marbles and tilt the box so the marbles spread the paint around. Do this on the wall with a thick layer of paint. Roll the marbles around on the wall with your palm.